I remember the summer when two of my kids found a couple of caterpillars down at our neighborhood garden. The next thing I knew, with the help of an old Oberweis milk jar, a few branches and some green leaves, we created our very first butterfly house. It wasn’t long before the two catepillars began to spin their chrysalis and settled down for their long winter nap but then after what seemed like eternity, reality began to settle in. In fact, by early spring we were really beginning to give up all hope when suddenly, on a warm sunny day, first one and then the other,made their long awaited appearance. We had two butterflies, which we soon their after released back into the wild. This recent article over at the Minneapolis Star-Tribune entitled “The Biology of Hope” by Andrew Wagaman brought all those memories back today as I read about the adventures of Associate Professor Karen Oberhauser and her Monarch butterflies, sprinkled with a little dose of citizen scientist, at the University of Minnesota Department of Fisheries, Wildlife and Conservation Biology. Reading this article definitely gives me hope. Okay, I have to say that reading The Mathematics of Life by Ian Stewart, has helped me to understand this article over at the New York Times, It’s entitled “The Simple Life, With Companions” by Carl Zimmer. So while I’m still trying to figure out the difference between genes and genome, it’s still a great read. So while I recently posted about the hellbenders here in the Ozarks (see the post Hell(bender) of a day), it turns out that their relatives out east also have some help. That’s according to a recent article in the Wall Street Journal entitled “Bronx Zoo Team Helps Hellbender Salamanders Go Home” by Will James. It’s nice to know that both the St. Louis Zoo and the Bronx Zoo are working together to help them out. I also found this website, entitled www.hellbenders.org, that gives lots of great information and reading for those interested in learning about hellbenders. It’s good to see that the Hellbender has lots of friends. Okay, so we’ve been back a couple of weeks now from the cabin up north in Minnesota and so when I saw the article “Cave Collector in Minnesota Hunts for Additions to His Empire” by James Card over at the New York Times, it reminded me of the book I read on caves up in the twin cities entitled Subterranean Twin Cities by Greg Brick. I’m hoping that one day I can get at least one of my kids to go on a cave adventure with me. While I was never too fond of them when I was growing up, I’m definitely intrigued now. I have to say, after reading “10 fun firefly facts” by Bryan Dugan over at Yahoo! Travel, I found out more than I ever wanted to know. 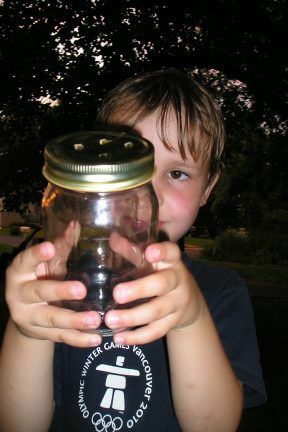 I think I’ll keep the fond memories I have of my kids catching their first fireflies in a jar at home. Alright, I missed Shark Week by a little more than “that much” but since I saw this feel good story about sharks today, I thought I would send a belated shout out to sharks. The article is entitled “Diver Reaches Into Mouths of Sharks to Protect Sharks, by Reaching into Their Mouths and Extracting Hooks” by Pete Thomas at GrindTV. And what post about sharks would be complete with an amazing story of their prowess. Check out how this large Tiger Shark impressed these scientist over at “‘Turducken’ of the Sea-Scientists off Delaware Catch Shark within a Shark“, also by Pete Thomas at GrindTV. For this post, I guess the title says it all. Seems every year my kids and I get involved in Amphibian Night with the Missouri Department of Conservation around late April. Anyway, the person leading that event is Jeff Ettling, a Herpetologist with the department and each year he also mentions one of his pet projects, the Hellbender project, in conjunction with the St. Louis Zoo. Well, I was just looking at the Saturday edition of the St. Louis Post-Dispatch today at work and what do I see but an article entitled “On a Hellbender” by Joe Holleman. It seems one of the projects volunteers recently won the prestidous Joseph Laszlo Memorial Award, given out to the person who advances the field of herpetology. Way to go Chawna Schuette! Okay, this time I mean it.